Publication details: Book. 2013. viii and 120 pages. Publication date: 2013-06-13. Hardbound, with many full color illustrations. A4 (8.3x11.7 in). Books dealing with color can be divided into two major categories. Many books exist that deal with the subject from an artistic and cultural point of view. The authors of such books are often suspicious of biological considerations in regard to color vision and its abnormalities and consider that aspect to be outside their field of interest. On the other hand, scientific books on color also exist, whether written by physicists, who limit themselves to the effects of electromagnetic radiation on matter, or by physiologists, who are primarily interested in theories regarding the various mechanisms of normal color vision. The abnormalities of color vision only interest them to the extent that they aid in the understanding of normal color vision and they tend to grant much reduced space to color vision abnormalities. For example, Sherman, in his excellent book entitled Colour Vision in the Nineteenth Century (1981) concedes only one chapter to such abnormalities. This is entitled Interlude and the colorimetry reference treatise of Wyszecki and Stiles (1982) does not even mention Dalton's name. 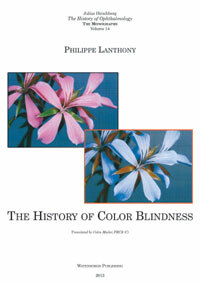 Thus, in a book dedicated to the history of color blindness and which intended to compliment the broader history of ophthalmology as a Monograph in the Julius Hirschberg series, it is logical to follow an opposite approach and describe pathological facts while largely omitting theories. The interested reader can easily check out theories in many available works on color vision. One will thus say less in this book concerning Young, Helmholtz or Hering than about those who are concerned with concrete aspects of color blindness, like August Seebeck, George Wilson, Jacob Stilling, Frithiof Holmgren, Ishihara Shinobu and Dean Farnsworth. This approach is practical and realistic for a medical ophthalmologist. He or she is concerned with detecting an abnormality in order to deduce aspects of practical management as these relate to professional orientation, public security or medical diagnosis. This book has therefore adopted an approach centred on the history of the diagnosis of color blindness and its practical consequences. It describes the acquired dyschromatopsias for the same reason. Most books on color pass rapidly over these in spite of their evident clinical importance in ophthalmology. Finally, there are two chapters that are particularly important because of recent developments: these are the practical understanding of the geographical distribution of color blindness (Chapter 10) and, most of all, the chapter on molecular genetics (Chapter 9) because of the rapid advances in the last twenty years. Progress in molecular genetics is so rapid that the text of this chapter could very soon be outdated. However it is important to remember history in all aspects of color blindness, because today's knowledge is but the sequel to yesterday's discoveries.